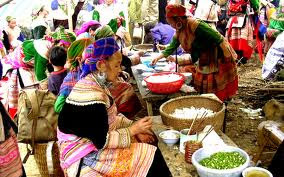 Beautiful and colorful Tuesday Market of the hill tribal peoples living around Coc Ly Commune and the northern region of Bac Ha District with festive atmosphere. 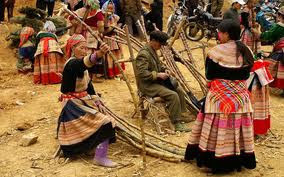 Meeting to hill tribal peoples such as: Flower Hmong; Black Zao; Tay; Nung…, who go to the market in their best traditional costume not only for shopping but mainly for socializing. Pick you up at Sapa Hotel or Lao Cai station then follow national road 70 traveling through the lush farm land of Lao Cai province for 42 km to Phong Nien Commune, turn left and follow provincial road 154 which sneaks through the country side along the Chay river for 17 km to Coc Ly which offers beautiful scenery of high mountains, narrow valleys and terraced rice paddies. Enjoy several photo stops along the way, especially of the beautiful tear farms near Phong Hai. Arrive in the market place at about 09.00am, at crowded time of the market. Join local ethnic peoples for about 2 hours of the morning to enjoy the exciting atmosphere as well as activities of this weekly market. Walk from section to sections, corner to corners, seeing and smelling of different local product, spices, vegetable, farming tools, handicraft, even medicinal herb…especially meeting smiling peoples every where. Coc Ly is also famous cattle market where local farmers from villages in the region sell and by cows, horses, water buffaloes, pigs…, and there is a large ground just beside the main market place for this activity. 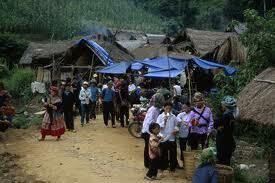 Chay River for 1.5 hour to Trung Do village of the Tay which is beautifully set on the bank of the river. Spend about an hour walking to explore this charming village before continuing the boat trip briefly to Bao Nhai. 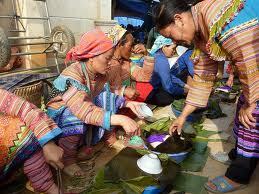 Enjoy late lunch in a local restaurant and then take 46 km road transfer back to Lao Cai station or Sapa Town on request. Tour summary: Total road transfer 142 km approx. 3 hours/ Market, walk & village visiting 3 hours/ Boat trip nearly 2 hours/ Lunch included. Once you’ve seen our programme, you can make any changes you wish. We are a very flexible tailor-made tour operator and we can design tours to meet our clients’ precise requirements. Please send email to Sapa Travel via: info@yourvietnamtravel.com for information about Sapa Tours and Vietnam and our sample tours. Book now for getting promotion rate.